This month’s box was disappointing for me. I haven’t really been this disappointed in a box, but maybe it was because I took part in the $10 add on and received items on the lower end of the spectrum. – A body lotion that smells like lavender and is supposed to relieve feelings of stress. Really? It does absorb nicely, but I’ll see how well it works when I’m actually under stress! – I don’t wear mascara everyday, (but I should since I have so many samples!) so I will be adding this to my collection. I am intrigued by it because it is a tubing mascara which I find works better on my lashes than actual waterproof mascaras that seem to smudge. I currently use the Blinc mascara which is similar to this Cargo one, so I will be trying it out and seeing how well it compares! – I’m not sure how these sample packets could be considered a “deluxe” sample because personally, I use these foil packets once and toss it out as I find it unsanitary to keep around for another use with no way of closing the packet. This brand also appears to be a drug store brand, but with Topbox I think most subscribers expect “luxury brands.” Correct me if I’m wrong! I don’t have terribly dark circles so these sample packets will not be of much use to me. – Tweezers, really? What if you don’t tweeze your brows? This product would deem useless. If any tools were to be included, I would have loved a makeup brush instead! Oh gosh, what a waste of money. I took my chances to partake in the add-on because some subscribers received such amazing products for the extra money in the month of November. Someone received a flat iron! So with that in mind, I decided to get the add on and boy, was I ever disappointed. I feel like Topbox hyped it up with the big products when they first introduced the add-on and since everyone realized the potential, they did the add on and lower valued products were thrown in the mix. I received 2 Pari products. – I don’t wear red lip products. – Nice colour, but I don’t need any more eyeshadow. I find it so disheartening that others received higher valued products for their add on ($50+ creams and Essie nail polishes $50-60 for example). It just doesn’t seem fair that others got better valued products than others. I’m not one to complain and I haven’t really complained about Topbox before, but this month I just had to say something. I’m thinking of unsubscribing very soon if this does not change. 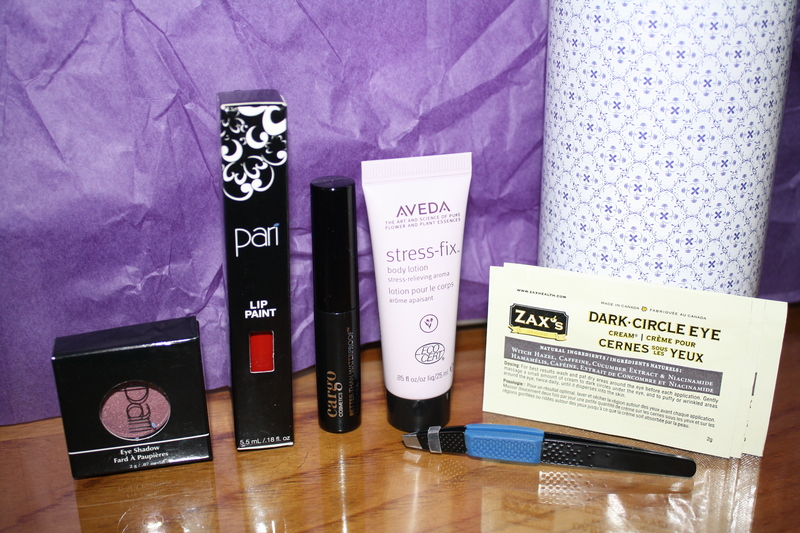 What did you receive in your January Topbox? A tiny makeup brush is ridiculous! I just wish the values of products for the $10 surprise were all similar, or else Topbox would not have a lot of subscribers complaining.